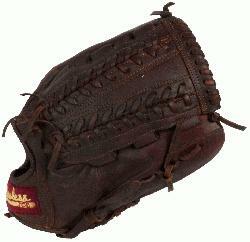 Shoeless Joe V-Lace Web 12 inch Baseball Glove (Right Hand Throw) : Shoeless Joe Gloves give a player the quality, feel and style of the gloves used by professional ball players over the last 100 years. You can choose glove models used in the first half of century in the Golden Age Series or today`s models in the Professional Model Series. The Shoeless Joe gloves are individually hand-cut and sewn from Special Aged Antique Tobacco Leather Hides. Shoeless Joe gloves are then hand-rubbed with old time ingredients to soften the leather before they go through their breaking in process that leaves the Glove with a beaten up and `Game Worn` look and feel, of a broken in glove. Thus each glove is unstructured giving it its own unique feature. Players can choose to play with an old time or modern day web without having to change to another model. A great play is lived only once, but your glove, you`ll keep it forever. If you end a game with a clean uniform our gloves are not for you.